Hundreds of rescue workers are still searching the waters around the Sewol, the 6,825-ton ferry carrying 475 people — 325 of them high-school students on a school trip — that sank off the coast of Mokpo, South Korea, on Wednesday. By Thursday evening, 20 crew members and passengers had been confirmed dead, while 285 remained missing, the Associated Press reports. 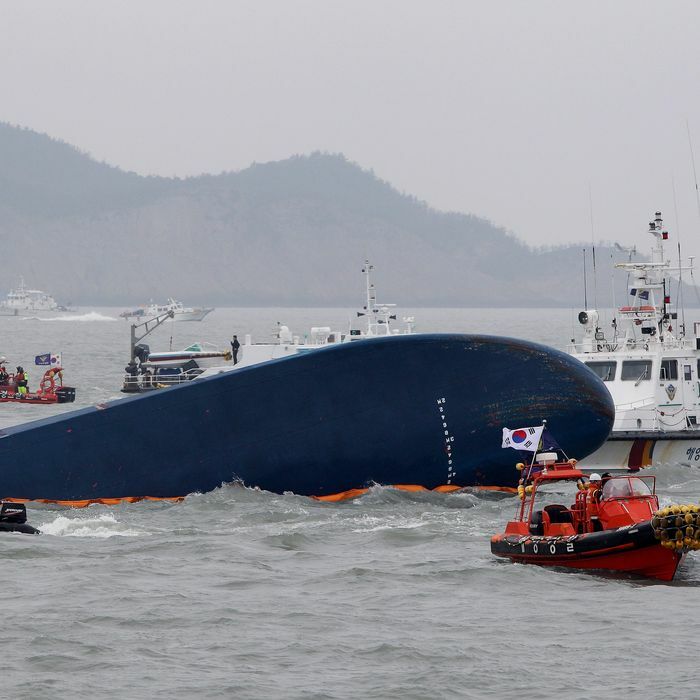 Boats equipped with cranes with which to salvage the ship are expected to arrive in the area within two days, South Korean coast guard spokesman Kim Jae-in said. So far, strong currents and bad weather have prevented divers from entering the vessel. It’s still unclear what caused the Sewol to tilt and eventually capsize, leaving everything but the bow underwater. The New York Times reports that officials who spoke to the ferry’s captain, 69-year-old Lee Jun-seok, believe that he made too sharp a turn upon realizing that he had gone off course. (In a brief televised statement, Lee, whose face was obscured by a hoodie, said, “I am really sorry and deeply ashamed … I don’t know what to say.”) One investigator told the paper that the Sewol’s cargo, which included 180 vehicles and 1,100 tons of shipping containers, may not have been secured properly. “That might have loosened them and caused them to slide to one side when the ship made its turn, and helped cause the ship to tilt out of control,” he said. South Korean news outlets have reported that few of the ferry’s lifeboats were deployed.